The Sun, Britains most popular newspaper publically announced its backing of the Conservative party some 6 months ahead of the next General Election. Whilst it is bad news for Labour, however it is not surprising given Labour's low poll rating and the Sun's own highly critical reporting of Gordon Browns government where it had resumed the role of pumping out biased Tory propaganda barely weeks within Gordon Brown taking over from Tony Blair in July 2007. 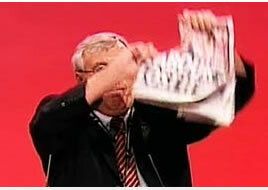 Union Leaders at the Labour party conference gullibly stepped forward to give the publicity shots of ripping the paper apart that have subsequently been widely reported on in the mainstream press. Back at the start of June 09, the Sun newspaper forecast a Conservative landslide victory of 414 seats, against my own projection of 343 seats as earlier in depth analysis of the UK economy concluding that a debt fuelled bounce in the UK economy is underway that will to large extent prevent a total wipeout of Labour MP's at the next general election as long as it was delayed until May 2010, which projected a Labour parliamentary party on 225 seats, Conservatives on 343, with the Lib Dems trailing far behind on a projected number in the region of 40 seats. Little has changed to affect my general election projection as the UK economy continues to bounce into summer 2010 as a consequence of unprecedented money printing actions and the out of control budget deficit. The only real impact of the Sun announcement will be for the paper to be punished by the Labour party PR department in the lead up to the next election by rejecting calls for interviews which will likely result in a further loss of readership that looks set to accelerate the trend that impacts all of the mainstream print media to steadily march towards extinction in the face of real competition from the internet, especially given the Sun parent companies dire financial state, Murdoch's News Corporation reported a huge loss of £2 billion to June 09 that risks disintegration of the media giant. Subscribe to my always free newsletter to receive my latest in depth analysis in your email box. So yes it does still have a very large reach! Although in these days of the internet the influence of print media has declined... If I remember correctly the ABCe figures state that The Guardian gets c.30 million unique visitors a month, how many does the market oracle get? So The Sun prints a headline that says Labour's Lost It and a few hours later a union leader is seen tearing shreds out of a copy of it. If he'd been foaming at the mouth the irony could not be any greater. Labour were happy enough for their support in 1997 as I recall. "We do not need an Australian/American coming to our country with a paper that has never supported one progressive policy and telling us how politics should be run in this country," he told the conference in Brighton. Fair point, but then again as I don't recall having the option of voting for TRupert Murdoch or Tony Woodley then the irony here is doubled. Some of us had wished that back in 1997, Labour had told Murdoch to stick his support where the sun don't shine, now twelve years latter and the publics perception of MP's at an all time low, i suppose it would be too much to ask for the Tory party to turn round to him and say" Thanks but no Thanks", the only support we want is from the people that are entitled to vote for us and not a non tax paying Australian/American. No doubt in the next couple of weeks, we will have to witness, David Cameron, the future Prime Minister of this country flying half way round the world, so he can thank Murdoch personally by kissing his arse!